Look what I’ve got in my email. 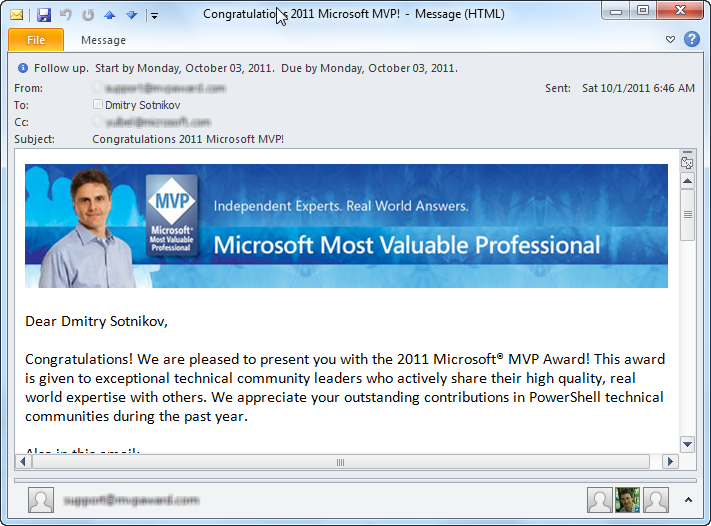 🙂 My Microsoft MVP (most valuable professional) award for another year. This is probably the 4th year I am getting the award, and is a great honor to me, and also really an opportunity to once again say that all my work for the PowerShell community is in fact a team work and not something I just do myself. So to everyone on the team of PowerGUI, AD cmdlets, powergui.org forums, and PowerShell Deep Dive – huge thanks! This award is really a testament of the great work we all do together to make PowerShell such a great technology and community. Also, congrats to all other MVPs who got re-awarded this weekend, as well as the new PowerShell MVPs: Bartek Bielawski and Alexander Chebotov (aka Kazun)! UPDATE: Denniver Reining PowerGUI Script Editor Color Picker and Snippet Manager add-ons fame is also a newly awarded MVP!!! Congratulations Denniver! Considering how hot and crowded virtualization space is, it is just amazing that PowerGUI (combined with PowerCLI and Community PowerPack) is number one among the free tools in this space! This set of free tools ranked number 1 on last years free tool list and it’s not going anywhere anytime soon. When you combine these three products together it becomes Voltron. Yes, I just used a Voltron reference! These three products bring with them a set of tools that can’t be found in anything else. 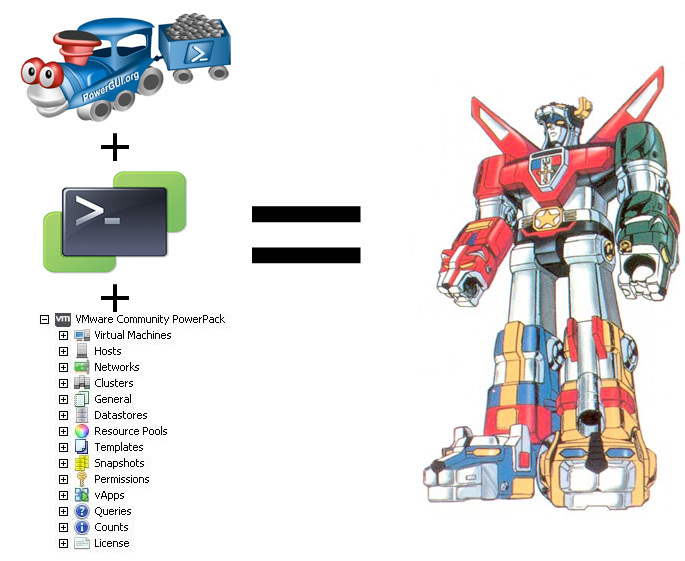 PowerCLI is the framework that makes it all possible. PowerGUI is the interface that enables anyone from a beginner to advanced user to become proficient. The PowerPack is the secret sauce that brings added functionality to every vSphere admin. Quest is currently working on updates for vSphere 5, but most of the functionality was there with the PowerCLI vSphere 5 beta I had been testing. Try it out and you will know why this tool continues to be on the Top 10 list. Remember that weird Windows IT Pro contest in which they put PowerGUI against gmail, iTunes, and a thousand other free and open source products? Well, the funniest part is – thanks to your support – we won the silver award in that huge category! Bronze for ChangeAuditor® (Best Auditing and Compliance Product). Quest Migration Manager received both the “ISV Winner” and “Preferred Product” in the Best Migration Product category. Quest Defender was recognized as a “Preferred Product” in the Best Smart Card/Biometric/Two-Factor Authentication System category. Site Administrator for SharePoint the gold award winner for Best SharePoint Product. Spotlight® on SQL Server Enterprise was named a “Preferred Product” by Redmond Readers’ Choice Awards. Please help us by casting your vote for PowerGUI’s Office Communications Server PowerPack by Curtis Johnstone at the SearchExchange’s Exchange Unified Communications vote. Note: the page is a bit confusing because they have some product ads right on the page. Ignore those 😉 and click the Vote here link instead. OCS PowerPack has been a huge success. It has already been downloaded more than 3400 times, and is being used in a lot of companies as a replacement or an addition to the native OCS management tools. However, even considering all that it is still very impressive that it kind of started living a life of its own and even gets nominated to awards like the SearchExchange one! If you have not tried the PowerPack yet check out my write up about it here. At the TechEd 2008 in Orlando PowerGUI has received the highest award of the show – The Breakthrough Product of the show. This award is for the best single product of the Tech•Ed 2008 IT Professionals, and could be from any IT Pro award sub-category. You can find the list of winners in various subcategories here. 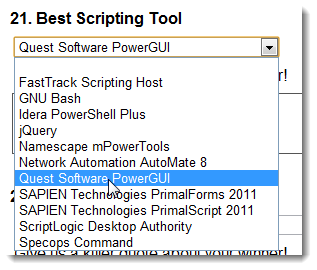 As I mentioned last week PowerGUI got into the finals of the best of TechEd award. It turns out there is also Attendees Pick contest and they have already set up the online poll. 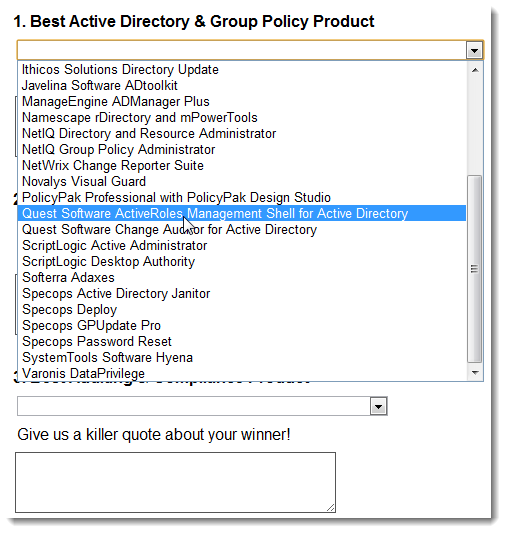 So if you are attending TechEd IT Professionals this year, please spend a minute, go to the site, find PowerGUI in the long list (use Ctrl-F or scroll down to the Systems Management and Operations category), and vote for us.